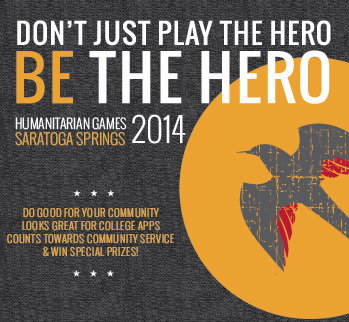 After months of development, design and planning, we are excited to launch the 2014 Humanitarian Games on April 1st. For one month, participants will travel from non-profit to non-profit completing community service requirements. This represents a unique opportunity for youth, their peers, and families to be introduced to area non-profits and the issues they serve to address. Having direct involvement with a local organization working on poverty, domestic violence or environmental issues, for example will help put these issues in perspective and lay the ground work for a lifelong propensity for service. Take part in this epic real-world game and hone the ultimate hero habit: compassion. This won’t be easy and only the best people with the most caring of hearts will make it through. Fly Solo or join with friends and family. After registration, players can choose one of several challenges. For example, one challenge is to prepare soup in Esperanto’s kitchen to deliver to a local food pantry and to the Shelters of Saratoga (limited to 10 people). After completion of the challenge, players will receive a QR code to scan using their smart phone OR a special code to input on a library or home computer. After scanning the QR codes or inputing the code in your computer, more challenges will be unlocked. Some challenges will also unlock special prizes.